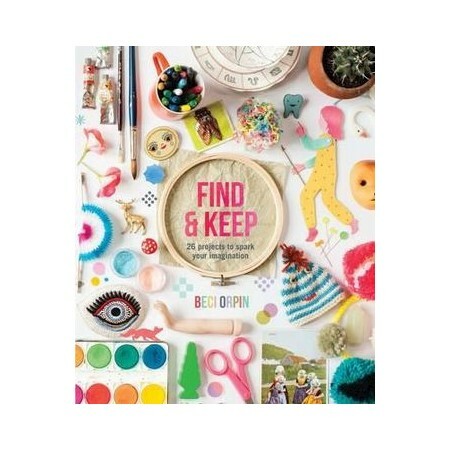 Be inspired with Beci Orpin's beautfiul new book Find & Keep. This gorgeous ideas and craft book features all of Beci's favourite things, from wall murals such as life-size paper Christmas trees, to embroideries and herb gardens and picnic fare. Discover where Beci gets her inspiration from and follow her in her studio, at home and out and about as she gathers ideas for her projects. Learn how these ideas come to life and then apply them yourself with 25 make-at-home projects that cover a wide range of crafty mediums, from collages to cushions and t-shirts to teacups. With simple step-by-step instructions and tips and beautiful page design by Michelle Mackintosh, these cool crafty ideas are new and fresh and bound to appeal to fans of Beci's work and crafting in general. So, get inspired, get creative and go find, make and keep! Beci Orpin was born in Melbourne during the early 1970s to hippie parents. For the first three years of her life, she lived out of the back of an landcruiser traveling around Australia, and never had to wear shoes. On return to Melbourne she moved into an inner-city commune, where she developed a love for drawing and decided that was all she ever wanted to do. She has a BA in textile design at RMIT and has been working freelance and exhibiting her artwork both locally and internationally ever since. With husband and business partner Raph, she started clothing line Princess Tina in 2001, and now has a clothing line, Tiny Mammoth; she also creates homewares and stationary-based products under her own name.